Here at EP Minerals and EP Engineered Clays, we have a unique way to kick off every week. One of our team members writes up the EP Way Fundamental of the Week and shares it with everyone in the company. It's always interesting to see how different people interpret our fundamentals, even though they're all variations on a consistent theme. We learn more about each other and see the fundamental of the week through another person's eyes, which is always insightful, given the wide variety of what our employees do. Our culture and fundamentals are what makes EP Minerals different than any other company. These principles guide all of us in how we conduct ourselves, how we make decisions and how we do business every day. This week's Fundamental is #5: Be Vigilant About Safety, and it was our new VP of Operations, Drew Shaver's turn to do the write up. Safety is a passion for all of us, but especially for Drew. Know and practice the safety procedures for each task you undertake. Watch out for the safety of your teammates as well, for you are your brother’s keeper. Be concerned for the safety of our customers and the safe handling of our products. Never take short cuts that compromise your safety or the safety of your teammates or our customers. I have spent my entire mining career focused on ensuring that all of my co-workers return home safely at the end of their day. It is a passion of mine that has been born of growing up in cultures that had let that fall short. I'm a 5th generation coal miner, and I have lost loved ones due to poor safety practices, and I have seen the heartache and suffering that this lack of focus and culture can cause. It is a reality that the work we do has hazards that must be mitigated on a daily and shift basis. This can be as simple as removing a tripping hazard in the office to improve our workplace safety in Reno, or as complicated as designing high end dust collection system at our plants to keep our employees free from respirable materials. The best way to ensure that we are vigilant about safety is to enable ALL of our employees to speak up when they have concerns and to consistently be their brother's keeper and watch out for one another. We all have natural distractions that can cause moments during the day where a mistake or poor decision could cause us harm. None of us are perfect and mistakes can occur. I hope that we will be there for one another and when we see something, we say something and intervene so that injuries and incidents are eliminated from our places of work. WE CAN do this together, but it takes all of us. I will be watching out for you, and I hope you will do the same for me. It is a simple plan, but I have seen it in action at our plants, mines, and offices. We just have to be vigilant to continue the effort and not get complacent. 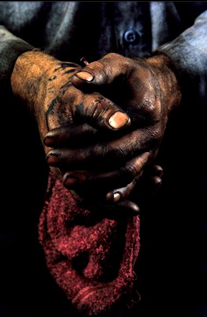 One picture I love to share is the one of "Daddy's Hands." It is a reminder that we have great people showing up for work every day and it is our job to ensure they have an environment where it is safe to communicate, and everyone has a voice and a seat at the table when it comes to our success. We must listen and take action on these voices as well. If our employees aren't out there mining the ore, hauling product to the plants, processing the products and preparing and shipping them to our customers, then we can't be successful. For all the office and corporate support staffs, we have the same voice in that success and your ideas to improve our business and streamline our efforts is what gives us the edge on our competition. Thanks, Drew, for this week's Fundamental write up! Want to learn more about EP Minerals and EP Engineered Clays? Visit us today.